Sol Katmandu Park & Resort in Magalluf on the island of Majorca is a wonderland that promises a fun-filled stay. A firm favourite among families and kids, this four-star holiday resort located in Calviá Beach in Majorca is just five minutes’ walk from the Magalluf Beach. 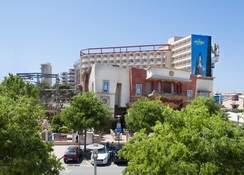 The property hotel is within the Katmandu Theme Park, which is considered to be one of the best theme parks in Majorca. All guests get free entry and a Play Pass to Katmandu Park every day of stay. The park enthrals adults and kids alike with exciting rides, epic 4D encounters, climbing thrills and splash park. 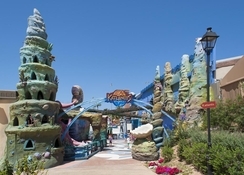 The hotel is also in proximity to fun family attractions such as a mini golf complex in the nearby Palmanova and Sol Wave House, just 250 metres away. Rooms at Sol Katmandu Park & Resort Magalluf come with a furnished terrace or balcony with views of the mountains, sea or garden. The hotel also offers a full range of amenities that includes themed buffet restaurant, three outdoor pools including one for children, spacious sun decks and sunbeds, varied entertainment programme, kids’ club, free Wi-Fi and lots more. The beachfront Sol Katmandu Park & Resort is ideally located just 250 metres from the pretty Magalluf Beach in Majorca. The hotel is situated inside the Katmandu Park, which means guests have free daily access to the theme park and its attractions. A 5-minute walk will take you to Magalluf’s town centre. The hotel is in close proximity to many entertainment and leisure areas. Golf Fantasía, a mini golf complex is just a short distance away in Palmanova, while the popular Sol Wave House is 250 metres from the hotel. There are several major golf courses nearby, including Golf Poniente (3 km), Golf Bendinat (5 km) and Golf Santa Ponça (9 km). Port Adriano is 7 km from the hotel, and the distance to the resort of Palma de Mallorca is 15 km. Palma de Mallorca Airport is 26 km from the hotel. Sol Katmandu Park & Resort features spacious, recently refurbished rooms and suites that suit all kinds of travellers. The warm tones, lively colours and modern furnishings make the rooms a perfect place to relax after an action-packed day at the Sol Katmandu Park & Resort. 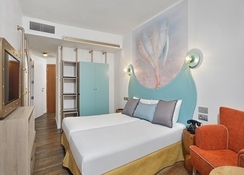 There are guestrooms specifically designed for families with two connecting bedrooms, two bathrooms, four beds and an optional cot. The rooms come with a furnished private terrace that offers great views of the Mediterranean Sea, the garden or the pool. Other amenities include flat-screen TV with satellite channels, wardrobe, air conditioning/heating, telephone, fully equipped bathroom with shower and toiletries, hairdryer, safe, mini fridge and amenities for babies. The themed buffet at Katmandu restaurant featuring an open live kitchen serves international cuisine for breakfast, lunch and dinner, including food options for kids and babies. 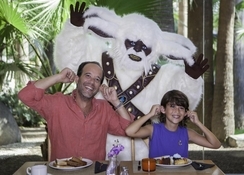 The hotel offers exclusive themed Character Breakfasts where kids can get up close with their favourite Sol Katmandu mythical characters. The Timbuktu Smokehouse Tavern dishes up fire-smoked favourites, from pulled pork sandwiches and pork ribs to frosty brews and desserts. The Steampunk Sweets shop inside the hotel serves desserts, sweets and beverages. Guests can treat themselves to classic American snacks or sides and a full bar at the Snack Shack. The Kat Landing Café is another to-go spot for snacks and refreshments. The Pool Bar, open until midnight offers a variety of hot and cold snacks, juices, drinks and cocktails by the poolside. The hotel also houses Legend’s Lounge and Bar that serves light lunch or snack as well as spirits, draught beers, soft drinks, fruit juices, cocktails and long drinks. The biggest leisure and entertainment attraction at Sol Katmandu Park & Resort is the Katmandu Park, rated one of Spain’s best theme parks. Every guest receives a Play Pass for exclusive free entry into Katmandu Park every day of stay and complimentary access to a variety of attractions. The hotel also features three outdoor swimming pools in the gardens, encircled with sun decks and complimentary sunbeds. There’s a lagoon-shaped pool, a circular pool and a children’s pool. 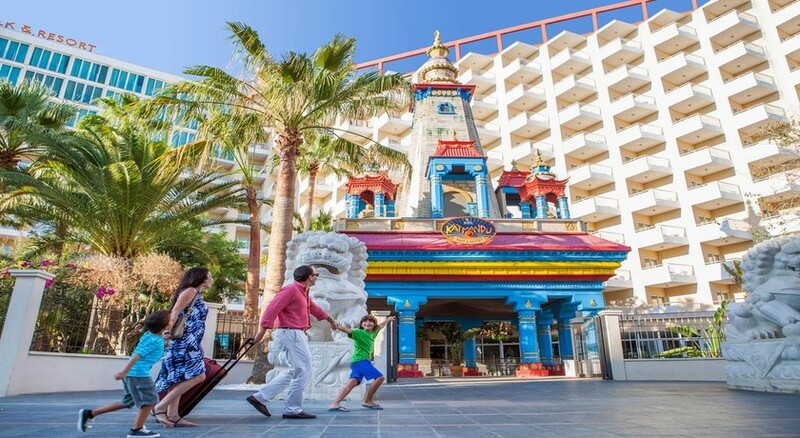 Kids have a gala time at Sol Katmandu Park & Resort Magalluf. Besides letting off steam at the Katmandu Park, they can join Kamp Katakidu, which consists of a baby club (for 8 months to 4 years old) and mini club (for 5 to 12 years old). Kids can attend the interactive musical show ‘Breakfast with Boro and Friends’ on select days. There are also Katmandu Park excursions and Katlantis, a wet and dry undersea world with water slides, splash pad and play area. There are golf courses, water sports options, tennis courts, athletics track and football pitch outside the hotel. Myself and family absolutely loved the hotel and all it had to offer! More than enough to keep 2 4yr girls happy and entertained. I had a great time going with my friend and her 2 year old. This place is ideal for children. The late night entertainment is great. The food was okay, a lot of junk food which can be repetitive and leave you bloaded but imagine it is like wherever you go. The staff were great and polite. I enjoyed myself. We have stayed at this hotel many times with little or no complaints, but this time we went the first three days seemed like the food was old with little to choose from. The breakfast was great no complaints there. To the rooms,The furnature onsists of a bed and a fitted wardrobe with a fridge inside. No table to put any thing on,no chair to put your clothes on. Very poor rooms ,when I asked the reception staff where was the furniture I was told the management decided that there was no need for a table or a chair in the room.